The What to do in Monterey County Section of the California Central Coast Travel Guide focuses on the Monterey Peninsula including such attractions as the Monterey Bay Aquarium, Cannery Row, Fisherman's Wharf, Pebble Beach, and Carmel. 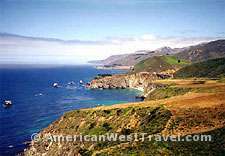 Also highlighted is the Big Sur Coast Highway, California Highway 1, from Carmel south through the Los Padres National Forest. One of the can't-miss points of interest is the Monterey Bay Aquarium, one of the country's largest and finest facilities. With several floors housing about 200 galleries, as well as part of the bay itself, the aquarium focuses on marine life in the Monterey Bay National Marine Sanctuary. The exhibits are generally broken down by region (Outer Bay Galleries, Near Shore, Kelp Forest, etc.). Allow several hours for a visit here. 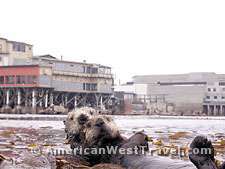 The Aquarium is on Cannery Row (historic link). The waterfront district of Cannery Row (visitor guide link) was once the center of Monterey's productive sardine canning industry. The district was made famous as a locale in two of John Steinbeck's novels. When the sardines gave out, the adjacent bay became a marine sanctuary, and the district became a popular tourist area with the aquarium, restaurants, lodging, art galleries, shops, and historic points of interest. The area maintains its old-fashioned look, and it is indeed a fascinating place for walking and window-shopping. Monterey's Fisherman's Wharf was once the locale of the fresh fish trade before commercial fishing diminished in the region. Today, the wharf is lined with seafood restaurants, art galleries, and specialty shops. Sea Lions can often be seen playing around the pilings and buoys. Numerous recreational cruises depart from the wharf. These include whale-watching, fishing, sailing, and more. There are many cultural and historic venues. The fascinating Monterey State Historic Park, preserves ten buildings dating to the early 19th century, depicting early Monterey. Guided walking tours are offered Tuesday to Saturday. The Monterey Museum of Art, in two locations, is also highly regarded. Pacific Grove is located on the outer edge of the Monterey Peninsula. It's scenic waterfront area can be hiked or biked on the park-like Monterey Peninsula Recreation Trail. It is also the northern starting point of the famous 17-Mile Drive. The private toll road meanders largely through Pebble Beach with some of the peninusla's most famous vistas such as the Lone Cypress (left) and Seal Rock. It also passes by Pebble Beach's world-famous golf courses. Pebble Beach is located south of Pacific Grove. It is the site of six world-famous golf course and numerous resorts. Most of the 17-Mile Drive is located in Pebble Beach, including the south entrance heading to Carmel. Visit recommendations: You can spend a day or many days in the area. For a short visit, go to the aquarium and then have lunch on Cannery Row. There is nice walking along the recreational trail in Pacific Grove, and a very beautiful walking trail at Asilomar State Beach, west of town. The town of Carmel, or Carmel-by-the-Sea, is the southern anchor of the Monterey Peninsula. It was originally founded as a mecca for artists, writers, and actors and its atmosphere hasn't changed much. An outstanding vacation destination, Carmel features a lovely municipal beach, a beautiful coastline, boutique shops and art galleries (with the work of local artists), and beautiful homes and gardens. One of the popular ways of seeing some of the town's hidden attractions is through guided walking tours. More walking opportunities can be found at Carmel River State Beach and Point Lobos State Reserve. Rich in marine life and spectacular coastline, Pt. Lobos has been called "...the greatest meeting of land and water in the world" by noted artist, Francis McComas. Outstanding history can be found at the Carmel Mission. Dating from 1770, the mission is one of the oldest and most beautiful of the early Franciscan missions. Heading inland, Carmel Valley offers rolling ranch land, wildflower meadows and meandering streams. Once a valley of ranches and farms, Carmel Valley is now part of Monterey County's outstanding Wine Country, also offering golf courses and upscale resorts. Visit recommendations: Again, spend a few hours or days in this area. The "can't miss" place is Pt. Lobos State Reserve. The Big Sur Coast Highway, California Highway 1, is really the primary attraction of California's Central Coast. The route runs about 100 miles between Ragged Point and Carmel and covers a series of cliffs with unmatched vistas of land and sea. In many places, the road is engineered into the cliffs, sometimes many hundreds of feet above the ocean. Spectacular bridges span precipitous canyons; the Bixby Bridge (below left) is one of the world's highest single-span bridges. The road has been improved over the years so it is fairly wide and comfortable in most but not all places. Never stop on the side of the road. The are numerous vista points with ample parking areas. The route offers fascinating contrasts. Long stretches along the cliffs offering large scale vistas are broken up by sudden turns inland into lush wooded areas followed by another stretch of cliff-hugging. Heading north you transit from the scrub covered hills environment of southern California to the lush wooded environment of Big Sur. Most of this area is undeveloped. Grocery stores and gas stations are few and far between. 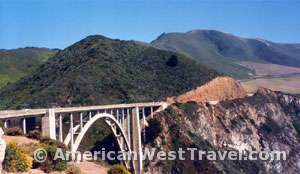 The few accommodations are of the lodge, cabin and bed-and-breakfast type, mainly around Big Sur town. There are several state parks and beaches with campgrounds. Reservations are strongly recommended at these parks. Visit recommendations: The "can't miss" destination of the Central Coast. The Big Sur Coast Highway is one of America's finest scenic routes. Take your time, stop at the vista points, and some of the parks and beaches. Stop overnight if you can get a campsite or lodging. The southern stretch of the Big Sur Coast Highway, from Ragged Point to about 40 miles northward, runs through a beautiful segment of the Los Padres National Forest. This virtually undeveloped area offers nothing but beautiful views of ocean and forest with great campgrounds, picnic areas, and hiking trails. Ragged Point - Cliff Trail and Nature Trail. On the property of the Ragged Point Resort, the trails start on the north side of the restaurant near the flower gardens. The nature trail loops around the grassy area on the promontory with a vista point looking north (the Million Dollar View) and a vista looking south. The Cliff Trail zig-zags down the cliff from the north vista point to a beautiful pocket beach with black sand. Both trails can be walked in an hour. Salmon Creek Falls. The trailhead is 3.7 miles north of Ragged Point, where the road curves inland. Signed trailhead is on south side of creek. Bear left at junction about 200 yards ahead. The spectacular falls are about 20 minutes from the road deep in a lush forest. It takes some rock-hopping to reach the base of the falls. Willow Creek Picnic Area. Picnic area and vista point with great views about 20 miles north of Ragged Point. Plaskett Creek Campground. Gorgeous campground, deeply shaded in Monterey pines on the inland side of California Highway 1. Large, dispersed sites, nice restrooms. Nice hiking trail in woods on the north end of campground. Easy access to Sand Dollar Beach and other trails on ocean side of the road (see below). Individual sites are first-come, first-served. You'll have to stop early to get a site during the busy season. About 25 miles north of Ragged Point. Sand Dollar Beach. Less than a mile north of Plaskett Creek, this gorgeous isolated beach is accessed by a series of stairs through the cliffs. There is also a picnic area near the parking lot. Across from the campground and south of the beach, there are trails of use in the meadowlands behind the cliffs. There is an overlook of the spectacular, rocky cove just south of Sand Dollar Beach. If you work around this cove further south, you can access the ocean at the base of the cliffs. Fairly easy hiking and off the beaten path. Kirk Creek Campground. 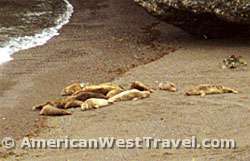 The campground is located on the ocean side of California Highway 1 on an exposed bluff with great views. There is beach access and hiking. Individual sites are first-come, first-served. Very tough to get a site here because of the great views. About 30 miles north of Ragged Point. Mill Creek Picnic Area. Just south of Kirk Creek Campground, the picnic area is on a bluff with scenic views. There is beach access. Visit recommendations: If you can get a campsite at Plaskett Creek, it is highly worth stopping for the night. Sand Dollar Beach is excellent, as is the hiking in the area.